pretix has been designed for multi-language capabilities from its start. Organizers can enter their event information in multiple languages at the same time. However, the software interface of pretix also needs to be translated for this to be useful. Since we (the developers of pretix) only speak a very limited number of languages, we need help from the community to achieve this goal. To make translating pretix easy not only for software developers, we set up a translation platform at translate.pretix.eu. are translated and maintained by the core team behind pretix or as part of long-term partnerships. We are committed to keeping these translations up-to-date with new features or changes in pretix and try to offer support in this language. are contributed and maintained by the Community. We ship them with pretix so you can use them, but we can not guarantee that new or changed features in pretix will be translated in time. are currently in the process of being translated. They can not yet be selected in pretix by end users on production installations and are only available in development mode for testing. Please contact translate@pretix.eu if you think an incubated language should be promoted to an inofficial one or if you are interested in a partnership to make your language official. 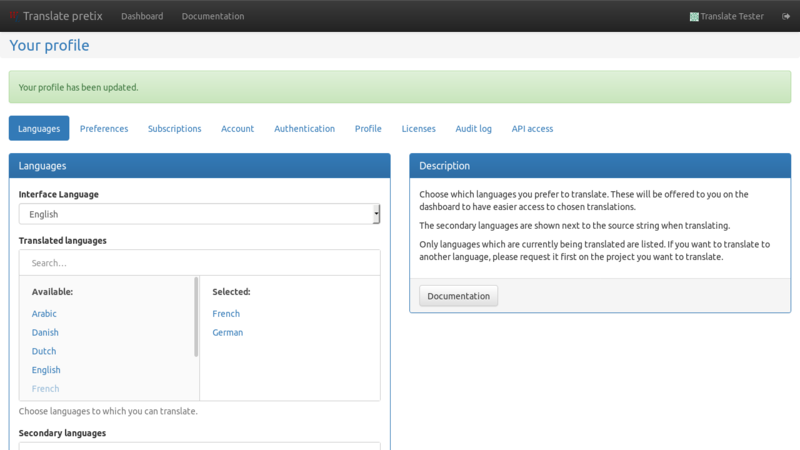 If you visit translate.pretix.eu for the first time, it admittedly looks pretty bare. 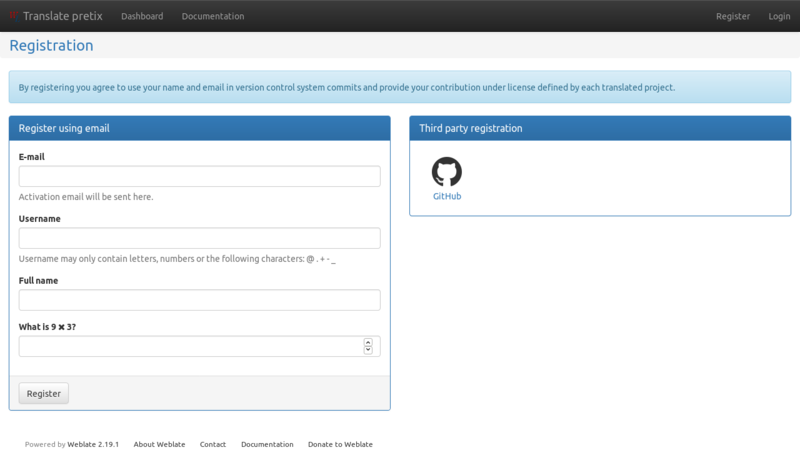 You can either create an account or choose to log in with your GitHub account, whichever you like more. After creating and activating your account, we recommend that you change your profile and select which languages you can translate to and which languages you understand. You can find your profile settings by clicking on your name in the top-right corner. 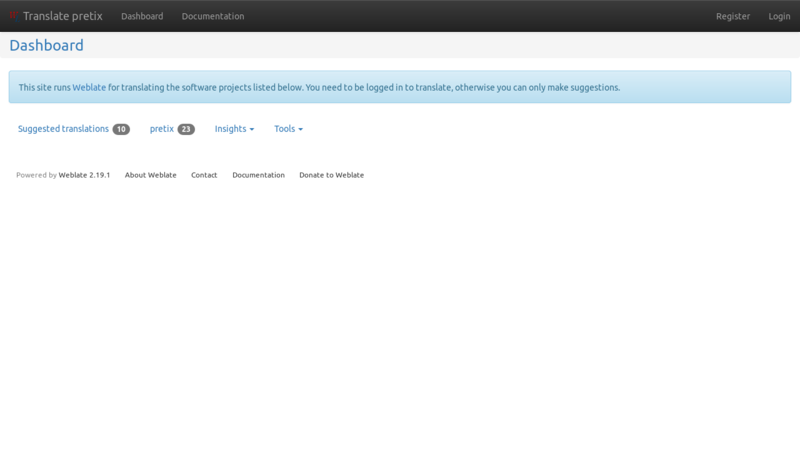 Going back to the dashboard by clicking on the logo in the top-left corner, you can select between different lists of translation projects. You can either filter by projects that already have a translation in your language, or you go to the pretix project page where you can select specific components. 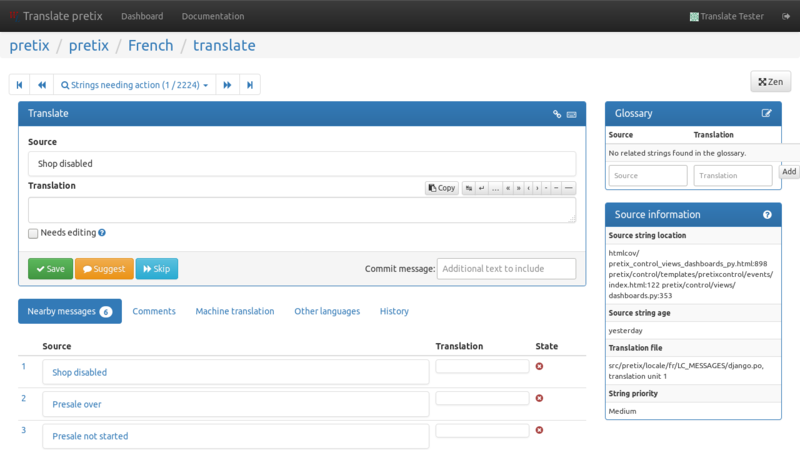 If you want to translate pretix to a new language that is not yet listed here, you are very welcome to do so! While you technically can add the language to the portal yourself, we ask you to drop us a short mail to translate@pretix.eu so we can add it to all components at once and also make it selectable in pretix itself. 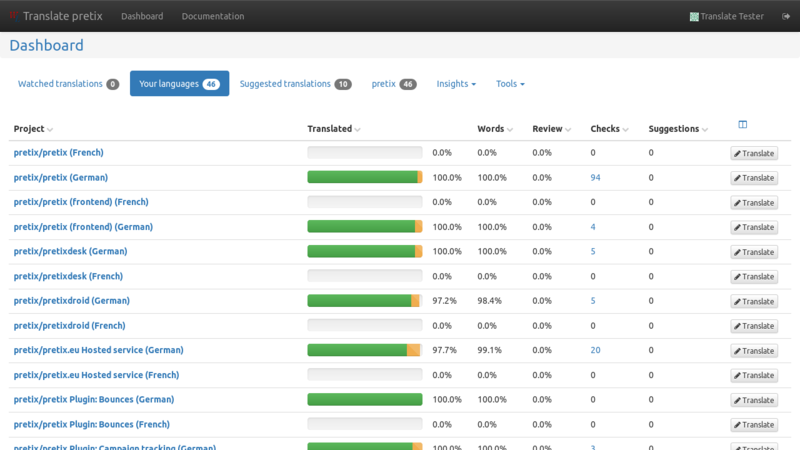 In the translate view, you can input your translation for a given source string. If you’re unsure about your translation, you can also just “Suggest” it or mark it as “Needs editing”. If you have no idea, just “Skip”. If you scroll down, there is also a “Comments” section to discuss any questions with fellow translators or us developers.